Oriental Customs.—The Greeks never use the salutation “Dominus vobiscum,” but always say in its stead “Εἰρήνη πᾶσιν,” eirene pasin—that is, “Peace to all”; to which is responded, “Καὶ τῷ πνεύματι σοῦ,” Kai to pneumati sou—“And to thy spirit.” The same forms are observed in all the other churches of the East, with very little difference. At several parts of the Mass it is customary with the Nestorian priests to make the sign of the cross upon themselves when using this salutation, which is generally, “Peace be with you all.” Their deacons, for the most part, say, “Peace be with us” (Badger, Nestorians and their Rituals, ii. 237 et passim). 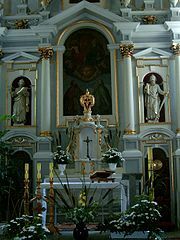 After having said the “Dominus vobiscum,” the priest returns to the Epistle corner of the altar, and there, extending his hands in the manner of a suppliant, reads from the missal before him the prayers proper to the occasion. As he is about to read the first he invites all to unite with him in the sacred act by reciting aloud “Oremus”—“Let us pray.” In former times it was customary to turn entirely around to the congregation after this invitation had been pronounced, and explain to them the precise nature of the prayer that followed, a vestige of which is still retained in the long series of prayers recited in the Mass of Good Friday, where we see a particular object prefixed to each. Another custom, too, that obtained in ancient times was for the people to enter into a sort of silent prayer, after they had heard “Oremus,” and remain in this quiet meditation until the general prayer was announced. This general prayer was denominated ἐπίκλησις, epiklesis, by the Greeks, from ἐπί, upon, and καλέω, I call—that is, an invocation—but in Latin it received the name of collecta, or collect, from the verb colligere, to gather together; because the common wants of the whole people were, as it were, brought together in it and laid before Almighty God. These prayers go by the name of collects even to-day (Bona, p. 319; Selvaggio, Inst. Christian Antiq., i. p. 1).